If you are about to post that “For Sale” sign up in your front yard, you are probably overwhelmed with the amount of things you must do. Relocating to a new home can be stressful. Once you have found your forever home, let National Dispatch relieve some of your stress by transporting your car. Car transport services eliminate drive time. This opens up an easier and faster way for you to get to your destination, by plane. Maybe, you would prefer to spend the winter season in a warmer climate. Texas, Florida, and California are all popular destinations for seasonal travelers, or snowbirds. Snowbirds are people who temporarily relocate to another state to escape the cold weather. Many of these people tend to use auto transport services to get their car to their destination. They do not have to risk driving under poor weather conditions, which present a number of dangers. Learn more about snowbird auto shipping. If you are about to be a college freshman, you are about to start a new stage of your life. During this time of independence, you will want to have your car with you. Whether you are going to a college a few states away or one that is across the country, you might need some assistance getting your car to campus. Hiring an auto transport company makes your life easier. No need to waste time driving. You can fly to your college town to move your belongings in. Your car will arrive safely and quickly to your destination. Learn more about college car shipping. People don’t just travel during the winter season. Extended vacations to locations across the country are popular during the summer. Children are out of school, and the weather is ideal for spending time in the sun. If you are in need of car transport services for your family vacation, count on National Dispatch. Why spend hours driving to your destination, battling traffic and other stressors? With the help of an auto transport company, you can start enjoying your vacation right away. Learn more about shipping a car for vacation. When you can’t find the car of your dreams, locally, your only choice is to look elsewhere. This means expanding your search outside state lines. When you purchase a car out of state, you must consider how you will be getting it home. You may think that your only option is to drive it. However, car shipping provides added convenience. Trust National Dispatch to get your vehicle to you in a safe and quick manner. Learn more about shipping a car to another state. If you are the owner of a classic car, you probably want to take it to an auto show to put it on display for all to see. The safest way to transport your classic vehicle is with a reliable car shipping company. Many classic car owners use auto transport services to spare their cars mileage. There are also many options available, such as enclosed auto shipping, that will shield your vehicle from the weather and road elements. Learn more about auto transport for classic car shows. If you are still in the planning stages of your move, you are likely still researching possible cities to call home. Add Arlington to your list. Arlington is conveniently located east of Fort Worth and west of Dallas. If you are a fan of the MLB Texas Rangers or the NFL Dallas Cowboys, then Arlington, Texas might be the place for you. In addition to being home to two major sports teams, Arlington is a great place to eat, work, and play. Mouthwatering burgers, smoked brisket, and barbecued ribs are just a few of the delicacies that you will find in Arlington, Texas. You will also find 2-foot long hotdogs covered in cheese, jalapenos, chili, and onions. After all, they do say, everything is bigger in Texas. Apparently, this doesn’t exclude the food. Besides the arenas and stadiums that cover the city, there are numerous other attractions to occupy your time. If you love theme parks, you should check out Six Flags. With hundreds of acres of thrilling rides, it is fun for the whole family. Other popular attractions include the International Bowling Museum, Arlington Museum of Art, and Planetarium. 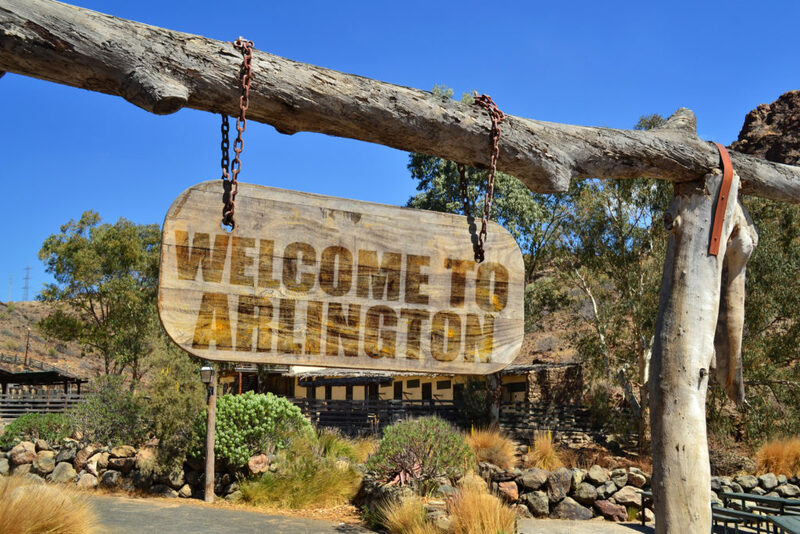 The most popular industries for employment in Arlington are education, automotive, retail, government, and entertainment. Some of the top city employers include the University of Texas at Arlington, General Motors, Six Flags, J.P. Morgan, and Texas Rangers. If you can’t find the job you are looking for within the city, there are more options a short drive away in Fort Worth and Dallas. Read more about shipping a car to Texas. You have decided to ship your car to Arlington, Texas. What’s next? Most car shipping companies offer a free car shipping quote form on their website. However, like companies, not all quote forms are created equally. Some auto shipping companies require that you put in a bunch of personal information to receive a car shipping quote, but not National Dispatch. Our car shipping calculator is different. Only four fields of information are required: vehicle make, vehicle model, pickup location, and delivery location. As you can see, we do not request any personal information, such as an email or phone number. Upon completing the form, you will be instantly redirected to your free car shipping quote. No waiting around. You get exactly what you are looking for in a matter of seconds. If you prefer to speak with a representative, you can use the online chat feature on our website. We are also available via phone at 800-321-2051.